after the buick got me to consider car as expensive, fragile and generally uninteresting, I began to think why not add a bike to my collection. aftera ll I had some room in the garage I rented. 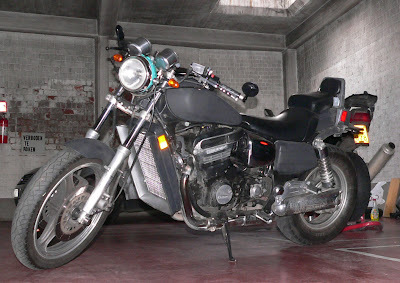 so it's not really by accident that I spotted that 1985 kawasaki zl900 eliminator on ebay. I always fancied those. if mad max road warrior had a bike it would be this one. it made the V-max look like a grand mother's grocerys cart. there never was anything that mean looking on two wheels. that is... not exactly THAT bike. it was disguised as a chopper with every bad taste accessories: 'live to ride" fake metal hand grips, california police windshield, chromed signals (both sides) leather bags and of course fringes everywhere. Two tone paint : dog green vomit and yellow sick cat piss. given for original paint but with lots of bubbles under the tank, so probably a repaint. I mounted a large dragbar, bar ends mirrors, tiny signals, and painted the whole thing flat black and on the raod again. this one was my sunday ride bike. that's the fun part. it looks like a chopper, it has a shaft transmission, but it also has a low rpm oriented ninja engine. the most powerfull of all sportbike engine of that time . raw power. I passed a lot of bikes on that, usually with one footpeg buried deep in the tarmac. ground clearance isn't that good. scary, but draws a lot of attention. exhaust are empty off course, so ear plugs required. It's not registered anymore. It was my daily ride for a couple of month when the rex died on my birthday. it's been sitting in my garage for the last year and a half.